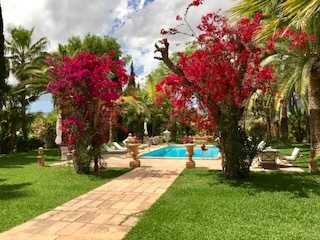 This unique finca is located between Binissalem and Alaró and offers easy access to Palma and the international airport. The lovely home is surrounded by a spacious landscaped garden consisting of a variety of local fauna as well as a duck pond and children's play area. Generous sized pool, hacienda style stables for horses and riding arena with floodlights, an art studio, garages, tennis court and under the pretty palm trees is the small chapel. This exceptional property offers five bedrooms, four bathrooms, study / library and two large living/sitting rooms, formal dining room and a modern fully equipped kitchen with informal dining. This fantastic home has parquet and terracotta floors, high ceilings, wooden beams, large windows with shutters, various porches and terraces, good natural light and plenty of space for family and guests. Mains electricity and own water well, internet and telephone line. Both Binissalem and Alaró offer various restaurants, cafes, tapas bars and fine wines sourced from local vineyards, banks, schools, supermarkets and local bakeries, sports facilities, doctors and dentists. For viewings, call us now!